Iraq and Afghanistan veterans will join anti-war activists at an emergency protest in London’s Parliament Square on Tuesday night ahead of Wednesday’s debate and vote on extending airstrikes from Iraq into Syria. 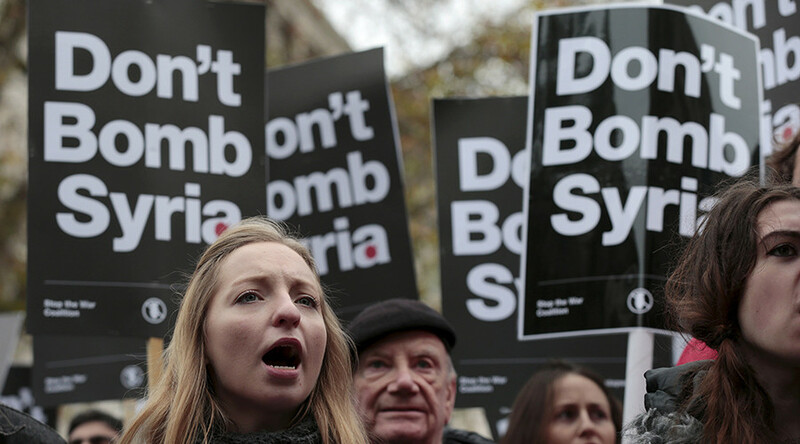 Anti-war activists will gather in Westminster for the eleventh hour protest ahead of Wednesday’s debate and vote. A number of MPs opposed to the intervention are expected to address the crowd. Scheduled to begin at 18.00 GMT, the Stop the War coalition protest could attract up to 3,000 people, according to its Facebook event. “We are very, very angry about this. We think it doesn’t represent Labour opinion; we think it doesn’t really represent wider opinion,” Stop the War convener Lindsey German told the Guardian on Tuesday. She said Labour leader Jeremy Corbyn’s decision to allow MP’s a free vote made it more likely that MPs would support bombing, but that many politicians seemed to be wavering. “I’m quite interested that whereas we were talking about 100 [Labour] rebels at the weekend, people are now talking about 50, even with the free vote,” she said. “The more that people scrutinize it, the worse the case looks. We are there to put as much pressure as we can on MPs,” she added. Similar protests will be happening in major cities up and down the UK over the course of Tuesday. Later on Tuesday, Stop the War released a statement urging a thorough examination of the voting records of those in favor of war. Many of the same parliamentarians who “voted for the occupation of Iraq in 2003, widely regarded as the worst foreign policy disaster since Suez,” the statement argues, are those “keenest on war” today. “Hundreds of thousands of civilians died and the country was plunged into the very chaos from which ISIS emerged,” Stop the War said. The statement also highlighted the situation in Libya, which the coalition attributes to the NATO intervention there in 2011. “Let their record speak for them, we should not follow them into another catastrophe,” it adds.